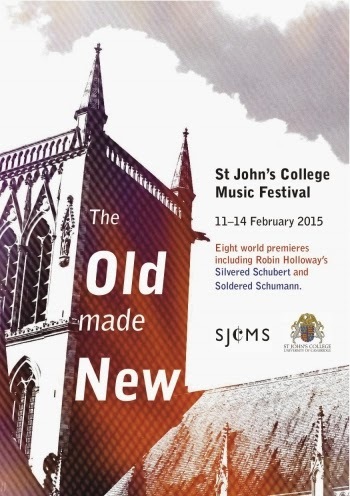 The festival explores the theme of 'the old made new', and includes madrigals by Monteverdi and Ligeti from the Gesualdo Six, and Bruckner's Second Symphony arranged for chamber orchestra by Anthony Payne. The pianists Patrick Hemmerle and Marie-Noelle Kendall close the festival with premieres of Robin Holloway's Silvered Schubert and Soldered Schumann for two pianos. Following on from Holloway's 1998 recomposition of Bach as Gilded Goldbergs the new pieces are based on Schubert's Fantasie in C major D 934, and Schumann's Andante and Variations, Opus 46. Schubert's original Fantasie in C major will also be performed at the concert by violinist Julia Hwang and pianist James Drinkwater. Further information from the festival website.